Ranked by Conde Nast Traveler magazine as one of the "hottest" hotels in the world, you'll see the stunning results of the transformation of a 100-year-old mattress factory into a modern luxury boutique hotel. 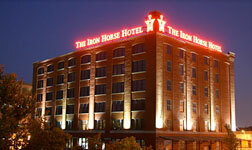 The Iron Horse is where business professionals and bikers alike gather to enjoy food, drinks, and the the views of Downtown Milwaukee and the neighboring Harley-Davidson Museum. The reception will include heavy hors d'oeuvres, networking, music, and a classic video game competition (dust off your mad PacMan skills). Even if you're tired from the day's travels, don't miss this event! Looking for something to do with your free night? Stop downstairs from the hotel at the Miller Time Pub and watch the Green Bay Packers battle the Minnesota Vikings on Monday Night Football. Or, if watching Brent Favre (what? is it Brett? whatever.) in a purple jersey isn't your thing, play some pool and darts or just enjoy a social atmosphere and some networking with your colleagues. Jayme Dawicki, whose music has been featured on MTV's The Real World, pulls together the perfect mix of upbeat and mellow original music. Also on iTunes. The Dirty Boogie is one of Milwaukee's most popular cover bands. Put on your dancing pants and boogie to the Boogie. Or sit and make fun of the ones who are. Food will be served throughout the night and don't forget to try the HighEdWeb custom brew - <htmALE>. 5% discount on Enterprise car rentals. Each attendee will receive an Experience Card with their registration materials, which is good for 50% admission to many attractions. Show your HighEdWeb badge for half off entrance to Milwaukee Art Museum (Andy Warhol exhibit in town) and 10% off in museum store. Check out incredible views of Milwaukee and Lake Michigan while enjoying a glass of wine or a cocktail located atop Milwaukee's most historic (and supposedly haunted) hotel. A popular spy-theme restaurant and night spot located at 779 North Front St. Nowhere will you find a sign advertising "Safe House." Customers find this place mostly by word-of-mouth. Make friends with a local and ask for the password to get in. Just blocks from the Hilton, head east on Wisconsin Avenue to Water Street and turn left to find a number of bars, restaurants, and clubs. Get to know the local UW-Milwaukee and Marquette University crowd. Some of Milwaukee's trendiest clubs and restaurants are located on Milwaukee Street. Want some Cuban food? Sushi? Steaks? 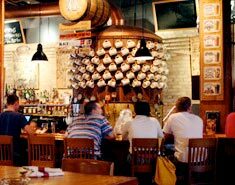 You'll find it on Milwaukee Street, along with the city's hip and trendy crowd. Head east from the Hilton down Wisconsin Avenue and turn left on Milwaukee Street. A favorite spot for Milwaukee's young(er) professional crowd, this former warehouse district has been converted to restaurants, pubs, art galleries, shops, and lofts/condos. Take Wisconsin Avenue east and turn right on Water Street...go under the freeway and you're there! A great spot to try: Water Buffalo, located on the corner of Water and Buffalo streets (go figure). Be sure to try the tortilla soup. Check out some Vegas-style gambling and a brand new $240 million expansion at one of Wisconsin's largest Indian gaming casinos. Hop on a shuttle right outside the Hilton.